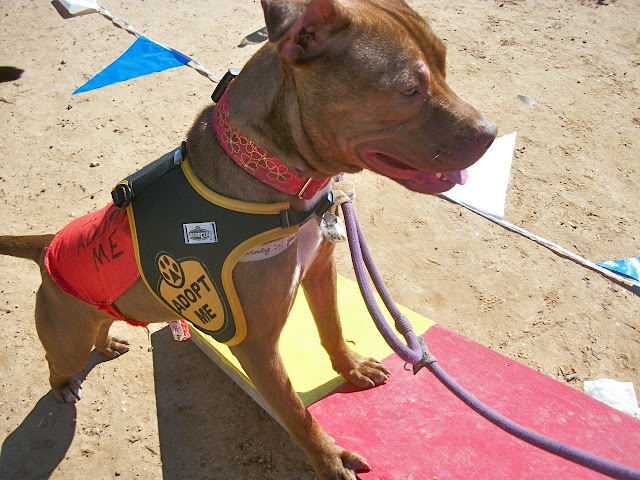 Sandy has been an absolute star at dog-friendly events lately. 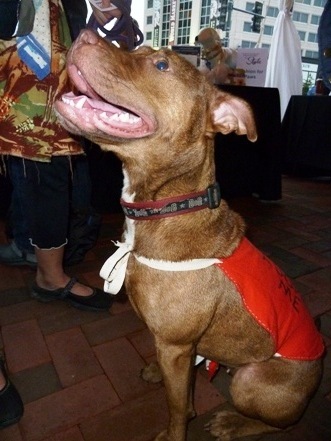 Last week, it was time to show off her high-fashion pittie style at Fashion for Paws, a benefit for the Washington Humane Society and Hope for Henry. Sandy fit right in with those runway models in their BCBG Maxazria (Did you know Cobalt blue is in this season? I sure didn't), and of course with all the well-dressed people handing out samples of lettuce wraps and guacamole and acai-flavored coconut water. It was a crowded, loud, busy tent, packed with models and vendors and volunteers and a few dogs, and Sandy was just as calm and affable as can be the whole time. I was so impressed with how readily she would give me a beautiful sit whenever I asked for it. Whatever dog she was trying to sniff or food scraps she was in the midst of scrounging, she was ready to show all those nice looking potential adopters what a well-trained little pup she is. We even got two pictures and a mention in the Georgetown Dish! There was even someone who was just about ready to adopt her, but it turned out she lived in Prince George's County--which has a pit bull ban! Although judging from Fozzie's experience, plenty of the Animal Control officials there will look the other way, that's definitely not something we want to mess with. 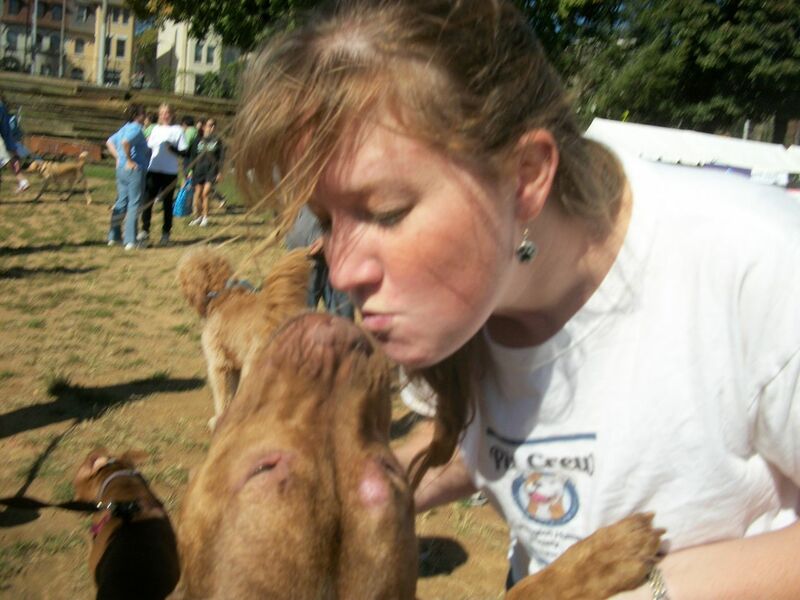 On to another event on Saturday, Washington Humane Society's DC Walk for the Animals. 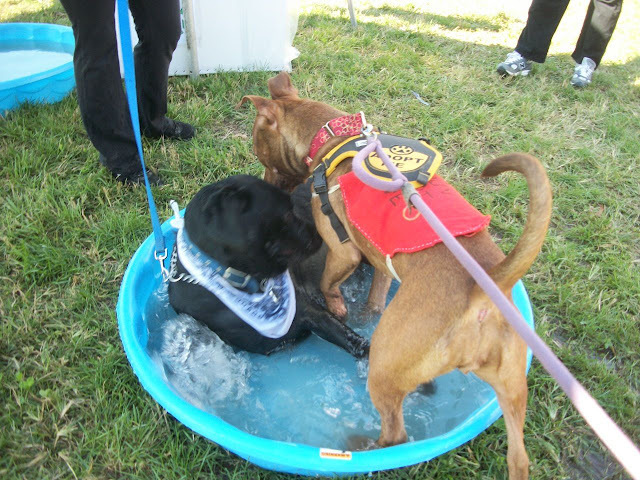 This was another fundraiser combined with an adoption event, though this time it was a bright sunny day and out in an open field in a neighborhood of DC. WHS is having lots of events lately, in order to meet its goal for adoptions and qualify for the ASPCA 100K Adoption Challenge, in which the participating shelter with the most adoptions during the months of August, September and October this year over their adoption numbers from those months last year, will win the grand prize of $100,000. and even an agility course for everyone to try out. 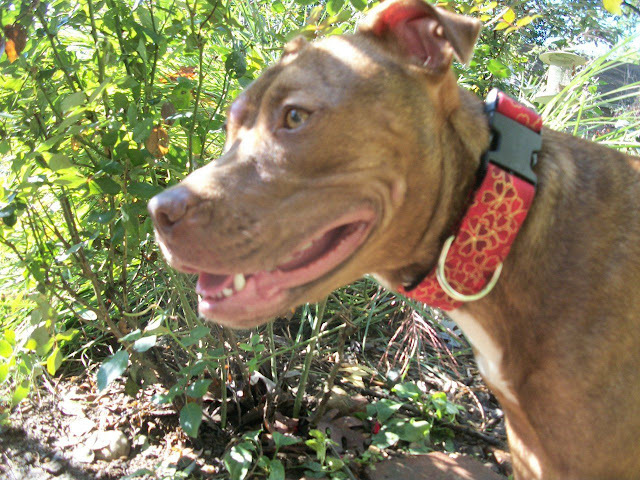 And Sandy got to show off her gorgeous new collar from Sirius Republic. 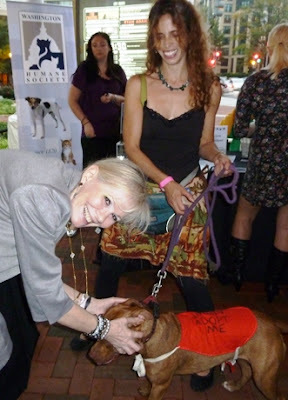 One of the nicest things about these events is that I've gotten to meet the other people who were involved in rescuing Sandy. 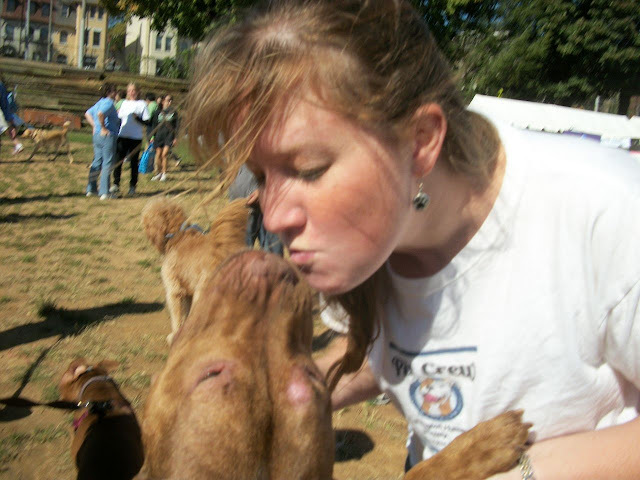 Sandy got to give a big wet kiss to Kirstyn, who actually works for Best Friends but works at the Washington Humane Society shelter to help rescue pit bulls. 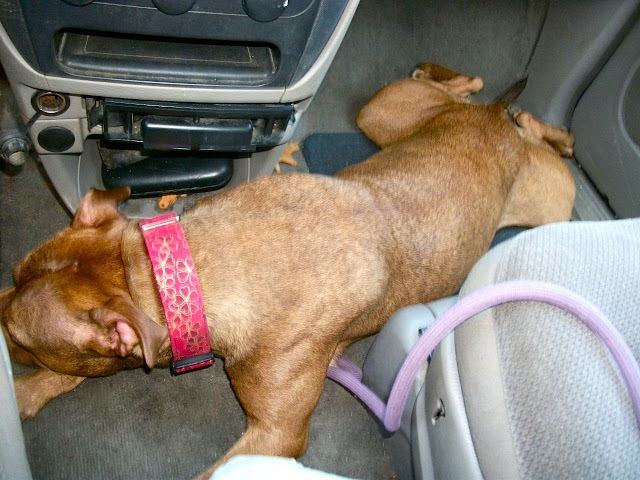 It was her email that I saw that prompted my impulsive act a few weeks ago and led to Sandy becoming my foster beast. We also met staff and volunteers who remembered her from the shelter, and told us that she was found as a stray and brought in with her pal Ginger, who went to rescue and left Sandy very sad and stressed. Sad and stressed she is no more. 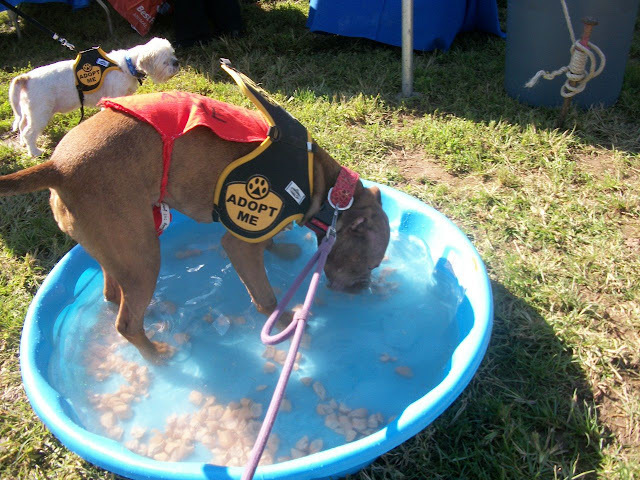 And best of all, nothing tires a dog out like an adoption event. We love her collar! And I love seeing a tired dog as much as the next person! Great events! What a good girl! By the way, where are those grey/yellow adoption vests from? Hi, you'll get adopted soon I bet. Good luck. Thanks everyone for the kind adoption wishes! Sandy is just lovely - and how wonderful that she has some lovely manners to go along with her beautiful looks! I am sure she will be adopted in no time, but how unfortunate that her would-be adopters could not do so because of the ban. That's just terrible! Aww! She's such a cute little thing! I hope she finds her own home quickly! What fun events Sandy got to attend! Bet she finds her forever home soon! She's a beauty with a personality to match! Sandy does make me smile. I adore her goofy bullie grin, it's irresistible:) I hope she finds her forever family soon, they're missing out on time with her! Awwww, Sandy is a cutie. She fits right in at a fashion show. Thanks for stopping by my blog. It's amazing to connect with other people fostering pitties, although I'm not still not sure that's what I'm doing. Good luck with Sandy. You're doing a great job with her.